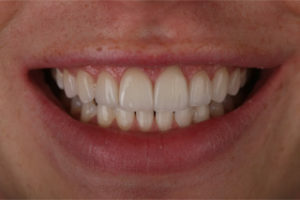 A 27-year-old air traffic controller presented to the office for porcelain veneers. He had a girlfriend with beautiful teeth, which is why he wanted a healthy and masculine smile. I completed evaluation of his smile using a ‘before’ picture of the full face and smile taken in my photo studio. The digital images were uploaded immediately to the computer and presented to the patient on the dental chair mounted monitor. From this position, the smile can be objectively critiqued by the patient and the dentist. The patient is allowed to vocalize his concerns regarding his smile. The dentist is then able to address those concerns and talk about possible solutions that fit in the patient’s budget. Options such as bonding and contouring, orthodontics, and direct and indirect veneers were given to the patient. After discussing how to improve issues related to smile design, we decided the best way to correct the width to height proportions of the centrals and laterals, as well as correct asymmetry of tooth wear and whiten the teeth, was through the use of minimal preparation veneers. The decision for minimal preparation veneers was made and diagnostic information was collected for laboratory communication. Upper and lower VPS impressions were taken with Ivoclar Vivadent Virtual Heavy and light body impression material. 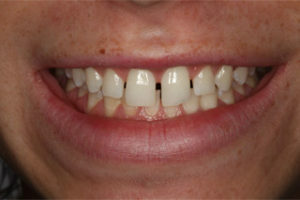 An open bite centric relation record was taken on the deprogrammed patient just out of occlusion using the composite ball technique as an anterior stop. Proper communication with Gold Dust enabled us to set the case up for minimal preparation of the porcelain material. This resulted in ceramic restorations that were both lifelike and conservative. Dr. Olitsky will be teaching a photography course in August. Learn more about it here!